Pharma Marketing Blog: The Cymbalta Buzz Machine is at Full Throttle! The Cymbalta Buzz Machine is at Full Throttle! * "Cymbalta Found To Reduce Chronic Lower Back Pain"
* "Patients Taking Cymbalta Experienced Reduced Chronic Low Back Pain in New Study"
* "Anti-depressant drug shown to help people with low back pain"
Click on the image to enlarge and read. My point is that even veteran reporters can be fooled by the spin put on these kinds of studies. Keep in mind that the back pain study involved ONLY 236 patients, which is hardly a basis for making any kind of statistically-significant conclusions -- something else I pointed out in my unpublished comment to Jim's original article. Not only that, the study was performed by a Lilly scientist and the data released at an obscure medical conference in Spain. Sounds similar to a "seeding study" to me! That is, a study of dubious scientific merit whose purpose is to entice physicians to prescribe Cymbalta off-label (ie, to treat an indication not approved by the FDA or any other regulatory authority). I pointed out previously that some Cymbalta direct-to-consumer (DTC) TV ads seemed to be promoting Cymbalta for pain beyond the limited "diabetic nerve pain" that it is officially approved for (see "eGAD! How I Learned to Stop Worrying and Love Cymbalta!"). As reported on the Furious Seasons blog: "...last year one academic paper found Lilly's claims of pain reduction in depression via Cymbalta treatment to be overstated and quite small in reality--an 11.5 percent effect size across several trials" (see "Lilly-Led Research Says Weak-Performing Cymbalta Good For Back Pain"). "But the FDA has already approved the drug for use in treating diabetic neuropathic pain and fibromyalgia. The latter approval came only in June . It's clear that Lilly very much wants to have the drug approved for at least one more pain indication so it can market the hell out of the drug--which is already being used off-label by pain management docs who are too scared of the DEA to treat pain with opiates and the Cymbalta results are not too grand from what patients tell me--but with a 12 percent effect size you've really got to wonder if the FDA would approve the drug because that is barely beating placebo in the real world. And, then, there are the drug's well known side effects--suicidality, nausea, fatigue, and withdrawal problems. One hopes that the FDA takes that sort of thing into consideration. 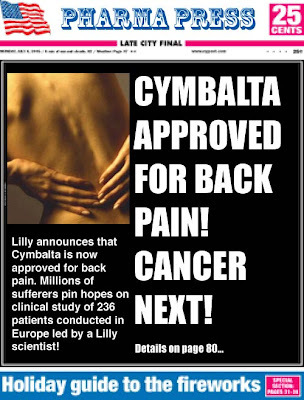 "And if this new study is part of Lilly's application for chronic pain (and I bet it is), then I'd really like to see Lilly put Cymbalta up against medical marijuana, which is approved for chronic pain treatment (and reportedly works pretty well) in several states. Bet the feds never let that trial happen." It seems that us bloggers are less prone to the hype than are veteran reporters! Yet the drug industry vilifies the press as being anti-pharma! Go figure. I mean, how much more could the press be under the influence of drug industry spin? Perhaps the industry covets no less than complete ownership of the press. I'll end this post on that note. "And, then, there are the drug's well known side effects--suicidality, nausea, fatigue, and withdrawal problems"
I have chronic pain. 52 years old, work full-time, Mother to a 9 year old son, and wife. I will NEVER take Lyrica, Neurontin or Cymbalta again or allow pain mgt specialists talk me into taking similar. Talk about "withdrawal problems"! I've never been as miserable in all my life as I was during the 3 times of 6 weeks each it took to get off Cymbalta - unremitting nightmares, trembles, sweats, trying to work with no sleep AND pain, which Cymbalta did nothing to help. In my view, it should ONLY be used for major depressive disorders in a limited # of people! and only then if they know how hard it is to stop; which no one is going to tell them. Throw it in the trash! and do not prescribe at all. John, I apologize if your post was unpublished. You'll note that it is difficult to get a comment published on BNET because we use a very strict system for registering commenters. I am not in control of that but I believe it is being reformed and comments will become easier to use on BNET in the near future. I actually had no idea you had commented until I read this post today. As for the changes made to the article, I did those shortly after posting the original when I realized I had misread Lilly's statement. There was no intention to mislead anyone, and certainly no intention of ignoring you, John. BNET bloggers actually get bonuses for comments -- so I am biased in favor of allowing you to comment! Thanks for your comment. It was not my intent to charge you with misleading your readers. If anything, you inform readers of the facts more than any other journalist I know. The point is that even someone as experienced as you can get mislead -- at east temporarily -- by the pharma spin machine. And other journalist seem to be completed mesmerized by the spin and write articles that just regurgitate the company's point of view, almost as if they were being paid to do it! Marketers (like me!) will stoop to any level - to get new drugs on to the market, and keep on expanding the market: geography by geography, target patient segment after another, and indication after indication. The Gardasil bandwagon rolls on from cervical cancer to vulval and vaginal cancers too - this really adds to the brand buzz on media and off media in clinics too. Good publicity there. I've also heard that a nasal insulin has been launched in EQUADOR! Why there of all places? Oh marketers you are all Dr. Jekyl and Mr. Hyde characters!! And thanks to bloggers and media they are kept in check! If it is only "approved for back pain" and the rest of the pain treatments are off label themn why are the ADVERTISING the drug for pain disorders via television? Is this not against the rules, advertising about "off-label" uses?